Malaysia has an abundance of amazing diving spots for experienced drivers. With a great amount of wreck dives and marine life, you don’t have to leave the country for a great dive. Located at the east coast of Peninsular Malaysia and known for its heavy currents, Tenggol Island is one of the lesser known island among the bunch and it’s a great place for experience divers. It’s accessible by ferry transfer from Kuala Dungun and has an almost untouched coral reefs that are filled with tropical marine life with wreck dives as well. Tuna, batfish, leopard sharks are more can be found there. If you’re lucky, you get the see the whale shark. Some of the diving sites are Tokong Timur, Mini Highway, Tanjung Api, Batu Chanang, Tokong Burug, Coral Garden and more. It is not advisable to visit between October and March due of the monsoon season. Located near Kota Kinabalu, the Mantanani Islands are great for muck and macro diving, the three isolated islands have great visibility even at 30m deep. Coral reefs with rich marine life can be found here. Octopus, cat sharks, bamboo sharks, barracudas and dugongs as well can be found too! There are also wreck sites like Usukan Wreck, Rice Bowl Wreck and Upside Down Wreck for you to visit. Located near Sipadan in the Alice Channel, it’s home to 100m drop-offs, wreck dives and more. You can find resting turtles on the reefs. It has a total of 10 dive sites dotted around the island with 23 more beyond its waters. Garden of Eden, Nudibranch Garden, Lobsters Lair, Hump Head Point and Turtle Playground are some of the sites to visit. Lobsters, eels, seahorses and barracuda are the few marine life that can be found here. It is also known for having the one and only underwater post office in Malaysia. Not only that, it also has a peacock sanctuary. Located in the South China Sea near Kota Kinabalu, on a big sand bank just below sea level, it’s a remote area where it is a concrete landing strip with one resort and a marine base. Corals in pristine and untouched conditions can be found as well as bigger species of fish. It’s home to 2000m drop-offs and sightings of pelagics. March – May is when you could possibly see Hammerheads passing by as you dive along the drop-off. The resort is only open from March – August. Located in Miri, it is a duty-free island offering two notable wrecks from World War II as well as other wreck spots. Divers with sufficient logged wreck diving experience or are certified are able to visit the wreck spots. Located in Kuching, wreck Japanese ships including the Katori Maru and Hiyoshi Maru can be found here. Both wrecks lie about 20m below the surface and it’s filled with great marine life like barracudas, batfishes and snappers. Another wreck is the IJN Sagiri (Destroyer), which sits at 26m and is the most recent wreck discovered in the area. Large groupers can be found there as well as guns and ammunition beneath the coral on the ship’s deck. 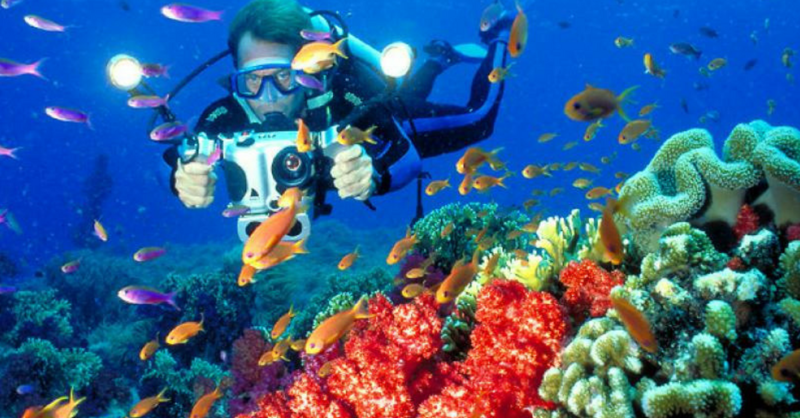 It is also listed in PADI’s recommended places for great dives. The best times to visit are between the month of April till September. Located near Johor, it’s a secluded tropical island that offers crystal clear sea waters. It’s filled with gardens of corals as well as a great deep-sea fishing habitat. Sailfish, sharks, stringrays, giant trevally are some of the marine life that can be found here. Electricity on the island is controlled and switched on from 1930 – 0730 daily. The best time to visit is April – July. Will you be heading to any of these gems? Let us know!